Founded in 1986 by Chile's Guilisasti family, Emiliana Vineyards is a privately owned initiative dedicated to producing wines made from organic grapes and, in the case of the super-premium Emiliana Gê and Coyam, made in accordance with biodynamic principals as well. Introduction of the debut 2003 vintage Gê marked the release of South America's first ever certified biodynamic wine. 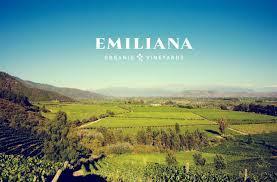 The progressive conversion of Emiliana's estate vineyards began in the mid-1990s. Today, Emiliana's vineyards total 2,812 acres in the regions of Maipo, Colchagua, Casablanca, Bío-Bío, Cachapoal and Limarí. Fully 1,470 acres enjoy official organic and biodynamic certification. The remaining 1,342 acres are ISO 14.001-certified and are transitioning to full organic status at a rate of 450 acres a year. Collectively, Emiliana constitutes the single largest source of estate-grown organic wines in the world. To underscore their commitment to making world-class organic wines, the Guilisasti family recruited consulting enologist Alvaro Espinoza to oversee the project. A visionary who is regarded as one of the world's premier authorities on organic, biodynamic and eco-balanced wines, Espinoza works closely with Emiliana's resident winemaker, Noelia Orts, on Emiliana's entire range of award-winning labels. Emiliana's three winemaking facilities are located in Los Robles and Palmeras in the Colchagua and in the Maipo Valley. The Guilisastis are not newcomers to winemaking and can point to a long and proud tradition of winemaking through their involvement in the management of the world-renowned Concha y Toro label. Fittingly, the current generation has named its latest enterprise in honor of 19th-century matriarch, Doña Emiliana Subercasseaux de Concha y Toro -- wife of Concha y Toro's esteemed founder, Don Melchor. Emiliana is, however, separate and apart from Concha y Toro, with its own vineyards, wineries, winemakers and distinctive winemaking philosophy. "A spicy and rich red with chocolate and walnut character packaged with ripe fruit. Full body, round tannins, and a flavorful finish." Soft yellow. Bouquet: Tantalizing citrus aromas of grapefruit and lime blend with notes of pineapple. Taste: Juicy citrus and tropical fruit flavors reappear on the palate. Nicely balanced with a delicious finish. "Bright ruby red. Bouquet: Bursting with berry aromas, spice and cocoa. Taste: Full of flavor with soft tannins, well-balanced acidity and a fresh finish." "Bright lively ruby color. Bouquet: Aromas of ripe, red and black berries with a touch of chocolate. Taste: Fresh and juicy palate has good structure and sweet, smooth tannins, persistent finish." "Light yellow in color, Natura Sauvignon Blanc displays a complex nose of lime and grapefruit blended with herbs such as boxwood. Citrus and herb notes reappear on the palate. A fresh, bright and pleasing wine with nicely balanced acidity and good persistence." Color: Intense red. Bouquet: Attractive, cherry aromas with hints of chocolate and spice. Taste: Big volume on the palate with soft round tannins, and a firm, well-balanced structure. Good balance between fruit and oak with a long, juicy finish.